As someone who grew up in Huntington Beach, CA home of the US Open of Surf and spent most us his life in and around the surf culture, I can not express enough how excited I am that Harley-Davidson recognizes the connection between the two worlds. When I lived in HB, I used to frequent and eventually worked for a dirt bike shop located on the Main St. in downtown HB called MotoXGarage, and one year we got to host Metal Mulisha at our shop after they performed a show at the US Open of Surf. On the same weekend, as Pro Surfers were hitting the waves, dirt bikers were hitting jumps, Skaters were getting air in a halfpipe and electric motorcycle vendors where showing off the latest tech all on the beach, THIS WAS IN THE EARLY 2000s! Since then California has seen companies do more cross over and embrace the motorcycle world. Vans was one of the first major sponsors to connect with the Born Free Show and compies like Iron & Resin and Tankfarm & Co have been embracing the surf/motorcycle work for a few years now and killing it! 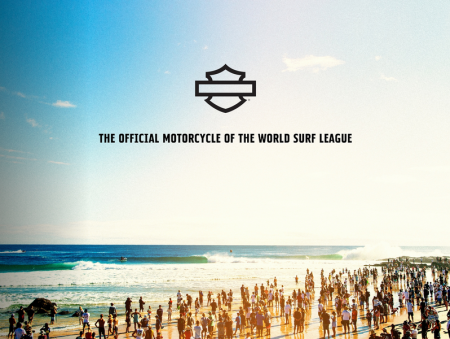 So today Harley-Davidson® announces they are partnering with the World Surf League (WSL) in 2019. Did you know that pro-surfing fans are 429% more likely to have ridden a motorcycle in the past week and are 259% more likely to buy a motorcycle in the next year*? With the success we saw in 2018 onsite at the U.S. open in Huntington Beach, and the overlap of passions between surfers and riders, we are expanding to a global partnership with the World Surf League (WSL) in 2019. As we work to grow the sport of motorcycling and engage riders and non-riders, people interested in surfing represent a big opportunity. There are more than 120 million surfing fans and 25 million surfers globally, we’re sure to make a splash through our WSL partnership! They’re highly engaged (the third most socially engaged audience behind the NFL and NBA fans**) and are chasing the thrill that riding and surfing have in common. This partnership centers around the shared emotional connection of the mind, body, and soul that one feels from surfing and riding. We’ll highlight the natural overlap in our audiences and sports and showcase how our shared values and experiences complement one another. When riding or surfing, you connect more deeply with the world around you and your mind clears of all worries. Riders, whether wheel or wave, experience a state of mindfulness and come alive on the ride. Throughout the partnership, we’ll strengthen this connection and extend the relevance of our brand to WSL fans. I am beyond excited to see where this takes Harley-Davidson®, and I hope to see more of my generation getting on two-wheels and hitting the road!